Hi, my name is Gary Hoffman. I write a column called The Amateur Amateur , which appears on the ARRL Web page. Some of you have been ham radio operators for a very long time, but I'm a relative newcomer to the hobby. I started out by listening to police scanners. Some years ago a number of us formed a police scanner club here in St. Louis. It's now called SABRE, or Saint Louis All Band Radio Enthusiasts. 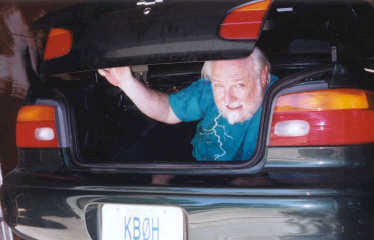 About 7 years ago Mike Redman, the president of the club, started teaching ham radio classes. That was not long after the no-code technician license had been instituted. My wife and I decided to attend Mike's first class. We took the FCC exams at the end of the class and received our licenses in early 1995. Very soon thereafter, I realized I enjoyed ham radio a lot more than I enjoyed police scanning. I was enthusiastic about the hobby but knew virtually nothing about it. I fooled around a lot, tried this, tried that, learned some things, and remained baffled by others. I wanted to talk to other hams, but they all seemed infinitely more knowledgeable than I was. I was afraid to approach any of them with questions. I figured they wouldn't want to talk to me. Ha! Little did I know that every living ham is just dying for the opportunity to share his wisdom with someone! I thought perhaps I could get together with other newcomers, but there didn't seem to be many of them. At least, I didn't know where to find them. There was some interest among the members of SABRE to get licensed, but also some fears. That's when I decided to write a column about ham radio for the SABRE newsletter. I figured that if I described my own ham radio adventures, and kept it light and humorous, the hobby wouldn't seem quite so forbidding. I called the column "The Amateur Amateur", implying that it was written by a rank amateur ham rather than an experienced ham. As far as I could tell the column was well received, but not many people were moved to comment on it one way or another. Those who did usually said something nice, but mostly I was writing in a vacuum. I thought I was writing a pretty good column, but really didn't know, since I rarely got any response to it. I griped about that to my friends and family, and eventually they suggested that I might try to expand my readership, perhaps even "go national". Well, that was both an exciting and frightening prospect. On the one hand I had fear. What did I, an admitted amateur amateur have to say to the nation's ham radio operators? On the other hand I had an immense ego. There was also the question of where to submit the column. QST magazine was my first thought, but it seemed like an impenetrable citadel of deep and ancient wisdom. I doubted that they would want a column written by someone who admitted that he knew practically nothing about the hobby. There were other, less imposing ham magazines, but I couldn't quite bring myself to submit my column. As luck would have it, though, I stumbled across a request-for-authors notice on the Internet. That was in 1997. A fellow named Dave Hamilton wanted to start a new ham magazine up in Canada. I wrote to him and described my column, and he wrote back and described his proposed magazine. He was open to all kinds of submissions, but most of all, he said, "It must be fun". Well, I figured that if my column was anything at all, it was "fun". I sent Dave some samples. He wrote right back and said that my material was exactly what he was looking for. Well, that made me feel good! I corresponded some more with Dave and we settled on the details. He wanted to change the name of the column because he didn't know what "The Amateur Amateur" meant. After I explained it to him, though, he decided to leave it unchanged. Money was discussed in very vague terms. Essentially, Dave would pay me twice what I was getting paid by SABRE. Since SABRE wasn't paying me anything,..... well, you can do the math. I did, however, get a free subscription to the magazine, which was called On the Air!. The magazine started up in September of 1997, and suddenly I was an "internationally published author". Talk about an ego trip! Dave didn't help the situation much. He told me that he was having difficulty with his other contributors. No matter how much he said, "It should be fun!" they still kept sending stuff that looked like technical manuals. He wanted to use my articles as a "writer's guide". Wow. I was not only an author, I was the ideal author! My head swelled to the size of a weather balloon! All that ended in late 1998 when On the Air! folded. My head gradually deflated down to normal size. Perhaps even a little smaller. A few years later, though, I started getting antsy again. I was happy writing for the SABRE newsletter, but I still got virtually no feedback. Once in a while someone would come up to me at a meeting and say, "I liked your article", but I really had no idea how the majority of members felt. It's tough to keep writing and writing and have no idea if you're reaching anyone. I decided to try again for a larger readership. This time, though, I stayed local. I wrote to one of the larger St.Louis area amateur radio clubs. I asked about the possibility of running my column in its newsletter. I never got a reply. While I was still stewing about that, I found that the ARRL was looking for people to write feature articles for its Web site. As I said before, I'd occasionally considered submitting my stuff to the ARRL, but I'd always chickened out. It was just too daunting. But at that very moment the planets were all aligned. The ARRL wanted authors, I was in the mood to expand, and I was angry at the local club for not answering my query. I sent email to Rick Lindquist, the senior news editor at ARRL. He answered and said, sure-sure, send me your stuff, I'll take a look. So I sent him an article I'd just written about calling in SKYWARN reports in the middle of a hailstorm. Rick acknowledged that he'd received my article, thank you very much, but he was going to be out of town for a week and it would be a while before he could get back to me. Ho-hum. Twelve minutes later, I got another message from Rick. "I could hear the hail and taste the fear," he said. "How often do you crank these out..?" he said. "..could we count on you to commit to ... a year?" he said. Well, obviously the man had read my submission in the intervening twelve minutes. He was hooked! A huge Grinch-like smile spread across my face. My head started swelling again. And this time, we were talking about actual money. Not a lot of money, but real touchy-feely money. Something with numbers other than zero in it. I tried to control my raging ego. I told myself that Rick was a guy who probably received hundreds of submissions a day, mostly dreck. He was probably happy to hear from someone who could write a coherent sentence. Nevertheless, I couldn't keep my head from reaching weather-balloon size again. Two weeks later, on June 14th, 2001, my column appeared on the ARRL Web site. I was unaware of it at the time. I got to work, logged onto my computer, and there was my first piece of fan mail. I quickly check the web site, and sure enough, there was my column. Wow. I was really impressed with myself. I printed out copies of my column and handed them out to all of my co-workers. I sent email versions to all of my family. I bronzed a copy and slept with it under my pillow. The best part, though, was that I was finally getting some feedback. I got email responses to every column I wrote, and almost all of it was positive. Talk about instant gratification! My head swelled to the size of a dirigible! Then came the day that I set my car on fire. It happened because I had improperly wired my mobile radio. There was no permanent damage, and I figured, what the hell, at least I'd get a column out of the experience. So I wrote about it. I had expected a response, but man! Was I in for a rude shock! Every ham operator in the western hemisphere wrote to me and said, "Don't you know about fuses, dummy!?" Suddenly I didn't feel so bright and clever. I'd just made an utter fool out of myself in front of the entire ham radio community. My dirigible-sized ego turned out to be the Hindenberg, and it had just crashed and burned. It took a while, but the experience helped me to get back to the job I'd originally set out to do, which was to chronicle the adventures of a rank amateur amateur operator, who was still experimenting and fumbling and occasionally falling on his face. That just about concludes my talk. I must add that I was somewhat nervous about coming here tonight. As I said, I received a vast amount of scathing email after the article about setting my car on fire was published. The only positive message I got during that period was from your president, Ron. He told me that he enjoyed my column and wanted to know if I would be the speaker at one of your meetings. I was at least half convinced that he wanted me to come to a club meeting so that you could all throw fuses at me. Of course, after your warm reception I know you wouldn't do anything like that.